Meb Keflezighi and Rita Jeptoo have won contrasting, but dramatic titles in the 2014 Boston Marathon. Below you’ll find my race reports for the men’s and women’s races, along with splits and thoughts from two interesting races, but which were so poorly covered that they leave me feeling underwhelmed. Nevertheless, enjoy the analysis, and I’ll be back soon with a wrap of the Spring Marathon season, which has seen surprises, debuts and exceptional performances from Paris through to Boston! The men’s race was won by the bravest athlete on the day, Meb Keflezighi, in 2:08:37. Perhaps fittingly, on this one year anniversary of last year’s tragic attacks, Keflezighi became the first American man to win in Boston since 1983. He did so in really bizarre fashion, though that was no fault of his. In reality, he ran an exceptional race – his race, textbook pacing and an exceptional display of assertive front running confidence. He went to the front shortly before 15km, and then ran consistently fast for the next 27km. His pace never wavered, and he was on course for a mid-2:08 the whole way. Meanwhile, the chase group, loaded full of high quality East Africans, was at first content to let him go. The lead was 10 seconds at 15km, 31 seconds by halfway, and then maxed out at 1:21 after 30km. In other words, the chase pack gave a former New York City Marathon winner a head start of 1:21 for the final 12.2km of the race, on a day when he actually wasn’t running all that fast. The time at halfway was 64:21, projecting a high 2:08 (the second half is usually slower in Boston because of the Hills), and that’s quick but not extraordinary on a good day for running. What was even more remarkable that it was done knowingly, and I say this because that chase pack consisted for 10 men all the way up to 30km. So you had 10 world class runners, who maintained a steady pace of around 15:30 to 15:40 per 5km (which is slow for them), while a good runner was allowed to build a lead over a minute for the final 10km. At one point, with about 12km to go, I wondered whether they’d even realized that there was a man out ahead, because a group of world class runners was choosing to run relatively slowly while a lead was growing all the while in front. The column of interest is the 5km split times, and not so much the min/mile pace or the speeds, because they are cumulative, which isn’t really sensitive to the nuances of how the race unfolded. What the 5km times show is that we had Meb maintaining a relatively consistent pace of between 15:00 and 15:20 per 5km the whole way. That’s despite the rolling hills after halfway, and the solo front-running for 25km. The chase group, however, allowed the pace to drop, right down to 15:40 per 5km, and conceded time to Keflezighi at every single segment between 15km and 35km. The comparisons were + 9, +23, +24, and +23 second, which left a gap too large to close. The chase group would eventually respond, which was clear after a group of 10 was cut to only 4 men between 30 and 35km. 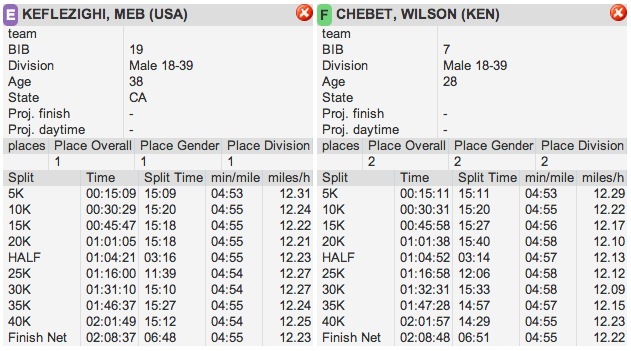 That was courtesy a 14:57 (note that Meb ran 15:26, telling you that it was uphill in big parts), and then Wilson Chebet emerged from 35km to 40km with a 14:29 split. That’s incredibly fast, but it came when he was already 52 seconds behind. It managed to cut the lead down to 8 seconds, but that’s as small as it got. At this point, Keflezighi was strong enough to resist the challenge, and Chebet was not strong enough to maintain it. At 40km, the gap had dropped so dramatically that it did look as though Meb and the USA would be denied the win. But Chebet faltered. The commentary, which was hideous, said he sped up, but they’re wrong – Chebet slowed down. As you can see in the table above, Chebet ran the final 2.2km 3 seconds slower than Meb, having closed him down by 43 seconds in the 5km preceding that. This tells you that Chebet burned his wick right down trying desperately to claw back the gap, and had nothing left from 40km onwards. He was himself almost caught for second by Frankline Chepkwony, who went from 81 seconds down at 30km to 51 s down at 35km to 24s at 40km and 13s by the finish line. A more measured effort, but still far too late to spoil Meb’s party. Ultimately, Meb ran a perfect race – even splits, he didn’t drop his average pace by more than a few seconds per km (over 5km segments, admittedly) the whole race, and he was rewarded with a fantastic victory. Score one for bravery. And deduct one for the chase group, who showed neither intelligence nor bravery, to have left a chase until after 30 km. Some bizarrely poor performances from the ‘chase group’ (that’s being generous) included Dennis Kimetto, who dropped out somewhere between 35km and 40km, and defending champion Lilesa Desisa, who lost 2 minutes to the chase group between 30 and 35km, and didn’t make it beyond 40km either. Ryan Hall finished 20th in 2:17:50, with a second half of 72:36. But today was Meb’s day, and a day for the USA to celebrate, testament to how courage and a smart race can produce rewards. His splits are shown below. Rita Jeptoo won the 2014 Boston Marathon in a new course record time of 2:18:57. She was the beneficiary of a great, brave run by Shalane Flanagan, who led from the very first meter, to pull the race through halfway in 69:28 (it would be a perfect even split, in other words). The group stayed relatively large, 8 then 7 women, until shortly after 30km, when the East Africans (there had been four Ethiopians and three Kenyans in Flanagan’s shadow up to that point) made the race’s decisive move. The pace was not lifted, as you’ll see from the splits below, but the course profile with the rolling hills meant that the 17:02 split from 30 to 35km was enough to split the group, and Flanagan found herself 16 seconds down. By 40km, Jeptoo was all by herself, and why not? Have a look at the split from 35km to 40km – she ran it in 15:44, quite incredible off a fast pace and having just left the rolling hills. Wilson Chebet’s 14:29 split for this same interval in the men’s race shows that this is a reasonably fast part of the race, but still, for Jeptoo to do that by herself was incredible. It meant two things – first, the course record of 2:20:43 was suddenly all but guaranteed (it was becoming touch and go, as you can see in the split list below), and second, it put paid to the challenge of everyone else. It was sufficient to open up a lead of 1:03 on Buzunesh Deba of Ethiopia, with a further 20 seconds back to the chasing pair of Dibaba and Sumgong. Jeptoo was not done, however. Her final 2.2km split was 6:51. Recall that Meb Keflezighi and Wilson Chebet did it in 6:48 and 6:51 respectively, and you realize just how fast she finished a fast race! That saw a huge record, by almost two minutes, and establishes Jeptoo as one of the world’s greats at this time. Much of the credit must go to Flanagan – in a race with no pacemakers, somebody has to take the initiative and she had no hesitation in leading the race all the way to 30km. A look at the leaderboard confirms that the first five women went under the old course record, and that tells you the class of the field, and the excellent aggression by Flanagan, who was rewarded with seventh place, and an American record in Boston. It also tells of the great conditions, which makes the blowouts in the men’s race all the more peculiar. Jeptoo’s splits are shown below. And that’s it from the Spring Marathon season. One last order of business is to share some thoughts on the big races – Paris, London, Rotterdam and Boston, and in particular to scrutinize some of the performances of note. We’ve seen great debuts from Bekele and Dibaba, and Farah’s disappointing one. We’ve seen some confirm themselves as the world’s best (Kipsang and Rita Jeptoo) and we’ve seen others experience disappointment (the Mutais, Kimetto, Lilesa, Priscah Jeptoo). I’ll try to get my mind around those later this week, when I post a Spring Marathon 2014 recap. Until then, thank you for joining me, and bring on the Fall!